Model 603: suction, heated professionalironing board, pre-set for installation of swivel arm and ironing shape. The working surface is heated electrically and temperature is regulated by thermostat. 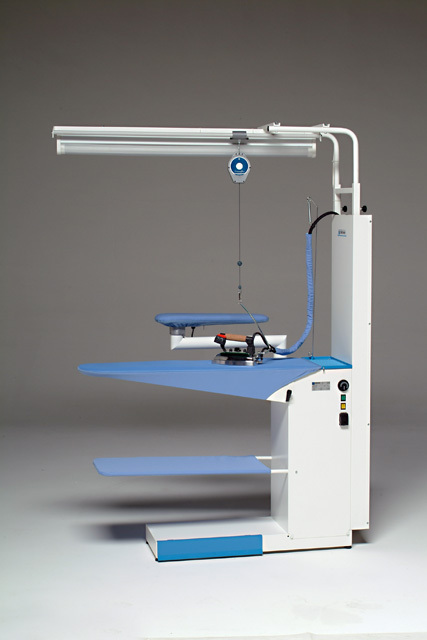 Qualified instrument for laundries, workshops and dressmaking dhops, the Model 603 bye the means of powerful suction keeps article always dry by reducing ironing time considerably. The excellent quality/price ratio and packing in cardboard box of mc 0,3 only (with reduced transport freights) both make the Mod 603 unique in this field. 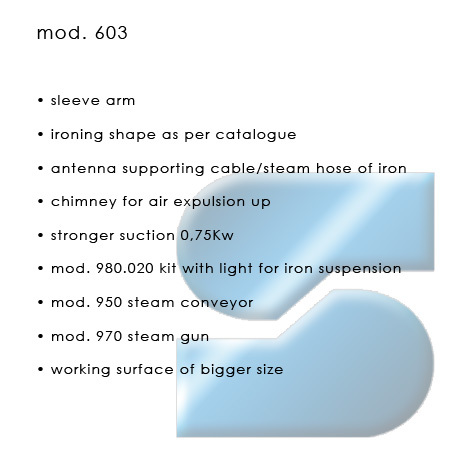 Model 602: has got the same technical distinctive of Mod. 603 but without presetting of ironing shape.